It’s official, we have now truly entered a “Brave New World” of sailing; either that or the world has truly lost its mind. This past fall, SAIL magazine first covered the Brest Ultime Challenge, a singlehanded nonstop round-the-world event set to take place in 2019 between a fleet of “ultimes”—mega-tris measuring 100ft or more (2016 Fall Multihull Issue: The Next Generation). Now, as the boats destined to take part in that race start sliding down the ways they are proving to be as ultime as expected. Leading the charge are Frenchman (of course!) Sébastien Josse and the Gitana Team with their new maxi Edmond de Rothschild, which was first unveiled in April and is set to begin trials later this month. Not only is the boat big (of course!) with an LOA of 105ft and a 75ft beam, but it has been configured to fly, in the hopes that Josse will sail in full-foiling mode at least some of the time he is at sea. Ponder that for a moment: a 105ft sailboat, literally flying over the water with only a single human being at the controls. Incredible! 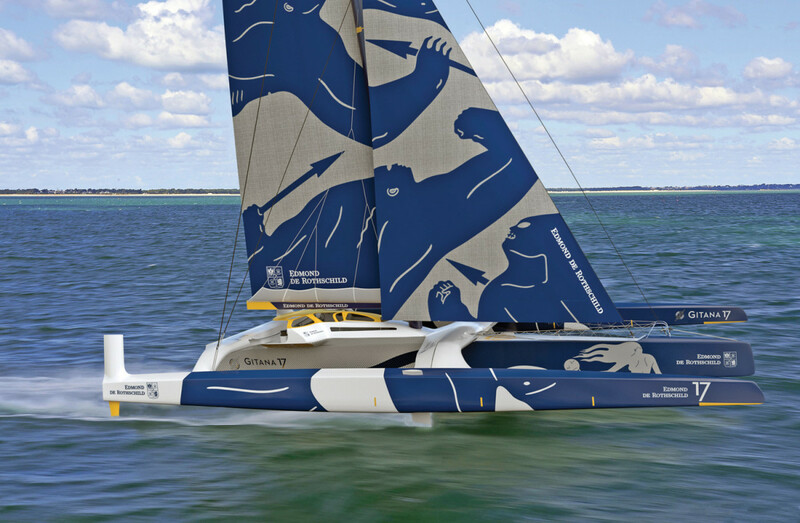 An offshoot of the team’s full-foiling Multi70 Edmond de Rothschild, a heavily re-worked MOD 70 one-design that has served as a test bed for many of those technologies same that will propel it big brother aloft as well, the new 105-footer features T-foil rudders, L-shaped foils in the amas, and both a daggerboard and T-foil rudder in the central hull. The hulls themselves have also been configured to plane quickly, while the overall design puts low windage at a premium throughout. The boat is expected to reach 40 knots in displacement mode. When fully airborne...who knows? All perfectly reasonable, of course. But what about when you have two of these foiling beasts going at it hammer and tongs in an actual race—as will almost surely be the case at some point during the Ultime? Do you want to be the first one to take your foot off the accelerator and then watch your competition go flying over the horizon? We didn’t think so. In other words, look for an event that could make even the fabled Vendée Globe look like a walk in the park by comparison. For more on the Gitana campaign, visit gitana-team.com.